Whether you're a serious home cooker or a beginner, you need a stovetop that can handle the heat. Many people prefer the smooth surface over the burners on a gas stove, but a flat-top stove also has potential disadvantages, including the possibility of scratches, staining and breaking of the top. Know what to avoid on your ceramic cooktop to keep it looking like new. The smooth surface on a glass-top stove is a big draw because it has one level surface that's relatively easy to clean after everyday cooking. Gas stoves and coil-burner electric ranges have burners with lots of nooks and crannies where food can fall, making cleaning more challenging. The flat top also can double as more counter space when not in use since it is one large, flat surface. Plus, it gives your kitchen a more updated look. Since the top of the stove is made of a ceramic and glass mix, it's prone to breaking under certain conditions. It's generally sturdy and strong, but you need to take extra care to avoid things that could crack it. The surface can also scratch with the use of certain cookware or cleaning products. Replacing the cooktop can be quite expensive. When it comes to the care of a glass cooktop stove, one of the best things you can do is buy safe cookware. If you buy the wrong type, it can scratch the glass surface, leaving it looking damaged. Most cookware with a smooth, flat bottom works on the stove. A pan with a curved bottom allows for the best heat transfer since more of the pan stays in contact with the burner, and pans that aren't flat could potentially crack the glass top. Avoid glass, cast iron and ceramic cookware, as they tend to scratch the stove. Cast iron cookware is prone to having burrs and rough patches on the outside of the pan. Cast iron takes a while to absorb heat, which can slow cooking, but once it does get hot, it holds on to that heat and may transfer it back to the cooktop. If you're using particularly high heat, the temperature limiters may end up shutting down the burner if the surface gets too hot. There aren't any crevices for crumbs or boiled-over food to get into on a glass stovetop, but they do require specific cleaning products and methods to prevent damage. For everyday food spills, wiping the surface with a wet, soft cloth should remove the gunk. If a pot boils over, wipe up the mess as soon as possible before it becomes much more difficult to remove. You can also use cleaning and polish products designed for glass stoves. Never use cleaning products containing ammonia, including glass cleaners, as it can leave streaks on the glass when you heat it. It's also best to avoid abrasive cleaners or scouring tools, as those items can create tiny scratches on your stovetop. Over time, those scratches can become more noticeable. For cooked-on food that doesn't want to budge, use a razor scraper tool held at a 45-degree angle to remove the food. You can soften the food first by spritzing it with vinegar or stovetop cleaner. Be careful not to gouge the stovetop with the corner of the razor blade. Heavy weight on the glass top can cause cracking and can require a replacement stovetop. Never stand on the stovetop to reach something above it. Avoid storing very heavy objects above the stovetop, as they could crack the surface if they fall or drop onto it. 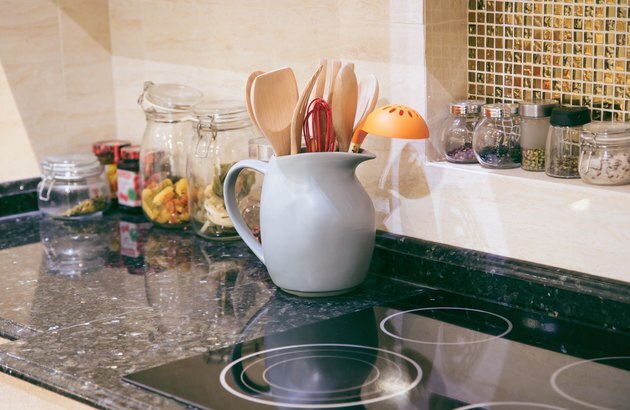 Most ceramic stovetops have a weight limit, which is likely around 50 pounds, so be aware of this weight limit if you're using heavy pots on your stovetop. For example, canning on a flat-top range can put a lot of weight on the surface between the pot, water and jars full of food you're canning. An alternative to traditional glass cooktops for serious home cooks is the gas on glass model, which combines both. You get a flat glass surface for easy cleaning and a modern look with gas burners on top for better heat distribution and control. Care is similar for the glass surface on these cooktops with fewer restrictions on cookware type since it has traditional gas burners. Caring for glass stoves isn't difficult, but it does require specific tools and methods to avoid damage. With proper care, your stovetop should look clean and new no matter how much you cook. Can You Use Cast Iron on a Flat-Top Stove?